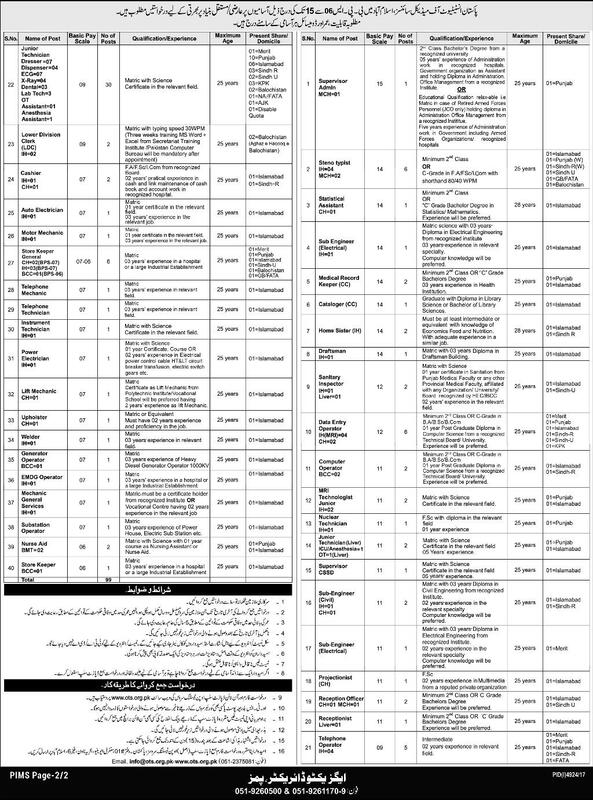 Government of Pakistan has announced 99 New Jobs in Daily Express Newspaper 11 March 2018 in Pakistan institute of Medical Sciences Islamabad. Candidates fulfilling the required Criteria may apply for Medical Jobs in Pakistan 2018 for Supervisor Admin, Steno Typist, Statistical Assistant, Sub Engineer, Medical Record Keeper, Cataloger, Home Sister, Draftsman, Sanitary Inspector, Data Entry Operator, MRI Technologist, Nuclear Technician, Sub Engineer, Projectionist, Receptionist, Telephone Operator, Cashier and Many Others. Intending Candidates are directed to visits Open Testing Service Website (OTS) to apply for these Latest Government Jobs.